While in Auckland for Christmas, I took my nephew Jamie for a short day walk in the Waitakeres Ranges. This trip we started Kamatura (near Huia) and took the Kamatura Loop, Fletchers, Donald McLean, Huia Ridge, Twin Peaks, and Tom Thumb tracks to loop back to the car. This highlights of this route were visiting the Tom Thumb Kauri Tree, and making it to the highest point in the Waitakere Ranges at Te Toiokawharu. While near the Manakau Harbour or the Tasman Sea at all times, this route was well forested and sights of these were far between. We did not get off to the best start with lanes disappearing causing navigation issues through Auckland's under construction motorway's and tunnels. we eventually made it to the start, well not quite the start actually. We started at the campsite at Kamatura Farm Park, not at Kamatura Park as was intended! The clown I am, I am. With the built environment navigation failures out of the way it was to time to jump on foot and get on with the tramp. Like our previous trip in the Waitakeres, segments of the trip are part of the Hillary Trail, which is a trail I must attempt contiguously at some point in the future. With our fractionally revised starting location my first observation was that the better campsite sites were not so much right at Barn Paddock, but at either side of the walking track between Barn Paddock and Kamatura Park. From Kamatura Park we briefly headed along the well maintained and manicured Kamatura Loop track/highway on which progress was rapid. It would have been easy to waltz past the junction up Fletcher Track to our left after 420 metres. Fletcher Track is more of a tramping grade track, and the word grade will come to mind with a few steepish sections to help us work off our Christmas eating. After about an hour of ascending 360m and moving forward 2.58km we reached the junction of Fletcher and Donald McLean tracks from where the track levelled out for an easy half kilometre to Kamatura Forks. At various times we found ourselves in front of, alongside and behind a group of three travelling this section on their mountain bikes. It was fun keeping up with them on foot ;). And for some reason satisfying - even as an enthusiastic cyclist myself. From the forks we continued with reasonably flat travel along the Huia Ridge track (2.73km; a little under an hour). It was slowly getting muddier and muddier and with track becoming more overgrown. This was even more the case once we turned onto the the Twin Peaks track that never seems to dry out. A short way (0.34km) into the Twin Peaks track we reached Te Toiokawharu, the highest point in the Waitakeres. Not only did Te Taikawharu not offer a view but there were some interesting discrepancies between the signposted 463m.asl which differed from both my hardcopy map and GPS which had the elevation a fraction higher at 474m.asl. The rest of the Twin Peaks track continued to be muddy, sloppy and reasonably undulated with 117m of climbing matched against 294m of descent. Jamie wasn't so sure that we twice as much descending as climbing on this section. Once at the bottom, the reward is to be greeted by the majestic "Tom Thumb" Kauri tree. Not too many this size to see around New Zealand after much felling of the sought after timber in the years gone by, including in the area we have been walking today. From the Kauri tree, it was another 3km/1 hour of easy track back to our car at Kamatura Farm with the highlight being the crossing of the Kamatura Stream. Times shown in this table and inline blog text above are indicative only. Travel times in the backcountry are variable depending on fitness, terrain, the size of your party, weather conditions and stopping times for snacks, photography, your interest in botany and such like. I briefly saw David Wilson and his impressive Penny Farthing in Wellington. Complete with panniers and full touring kit, David is riding the length of the New Zealand unsupported. As a distance rider myself I know what an accomplishment that will be riding on vintage hardware. After120 odd years with the "modern safety bicycle", it is not often you see an "Ordinary" - let alone one that is touring such a distance. 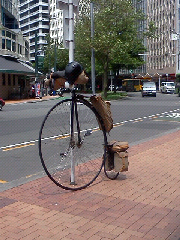 David is scouting out potential routes for a Penny Farthing tour of New Zealand in 2014. I will be sure to keep an eye on developments for the tour to make sure I get a good look at the array of "ordinary's" while they are on tour here in New Zealand. 1. To prove that this is only a little pond to cycle around. 2. 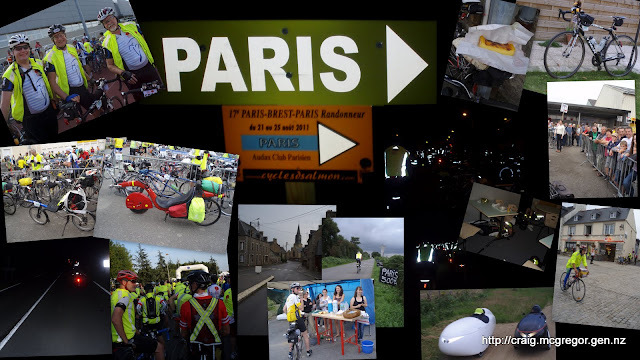 To complete 1200km in less time that I took to complete the Paris-Brest-Paris in August. I had convinced myself riding eight laps would prove that it was only a little pond and that without the plentiful supply of pastries and crepes to distract me, I could surely complete this 1280km ride in less than 85h32m. Ultimately I proved this to only be a little pond, however four days of gale force winds was a much greater hindrance than the plentiful supply of pastries, flans and crepes in France. At the start-line for the eight lap Extreme Enduro was a small field of RAAM finisher, Ron “iRONman” Skelton; Cape Reinga to Bluff record holder Colin Anderson, Arthur Schwencke, Neville Mercer, myself and Bill Lane who was about to start his third lap of ten. Nick Dunne was already well into his third lap of ten. Ron appeared focussed and determined to win at the start-line and four days later it wasn’t so much as daylight between Ron and the rest of the field - it was almost an entire planetary rotation with a 21 hour gap between 1st and 2nd place. With five others, we rode together until turning-off from Control Gates Hill into Pohipi Road. Colin Anderson wisely advised me it would be a lonely ride from here. He wasn’t wrong. I did briefly see Colin later in the lap but I certainly was mostly riding solo aside from the regular swapping places between Arthur and myself for the next eight laps. We certainly were similarly paced with the ebb and flow of proceedings having one of us the stronger than the other at different times over four days. It was mostly riding in solitude, although I had the company of endurance cycling fan and future NZ Outdoor Track 24hr record aspirant Stu Downs for about the first 40k of lap five (or was it six?). By lap seven, the main event had begun with the elite races, 160km solo and relay events all underway. I had been planning on being on my final lap at this time, but not to be with a brutal slow ride of battling the breeze. I rode amongst a number of different riders during lap seven, most of whom thought was crazy, insane or just plains stupid for riding eight laps. I felt obliged to point out it was excellent value at only $12 per lap compared to their $99 per lap . The 2011 Lake Taupo Cycle Challenge is destined to be remembered as the year of the wind. In the case of the Extreme Enduro it was a case of an entire four days of gale force wind - making the Extreme Enduro far more extreme than I had anticipated in advance. Friday night was by far the worst. With the wind gusting beyond 85km/h there were branches flying past me, and the road became a slalom course of broken branches to avoid. There was a point of almost stopping during these conditions. After brief reflection, I was simply too stubborn to quit with only one and half laps remaining. In the light of Saturday, the Huka XL mountain biking event was cut short due to trees falling. I assure you by that time the wind whilst strong, was not as fierce as it was in the early hours of the morning! Given the branches flying past me on the road in the night, I can assure any disappointed competitors from the Huka XL, that it would have been incredibly dodgy in the forest and I suspect impossible to run the event safely. Accessories - Unbelievably after thousands of kilometres of riding in New Zealand and France with an identical bicycle and lighting setup I had nothing but trouble with my lights on this ride. I think this was large the result of a chip-seal roads that had a lot of trucks peeling some of chip-seal from the road making it a reasonably rough ride for a sealed road. I had a few issues with the bumps bouncing the battery cables out of my Ayup lights and a few similar instances reset my Garmin 705 bike computer to zero (possibly related to my auxiliary Duracell power supply). I also lost my backup light overboard, never to be found again when descending Kuratau Hill in the middle of the night. The Busch & Mueller Ixon IQ was an excellent light powered by Nimh AA rechargeable batteries with both a good range and spread of light emitted. Unfortunately, the mounting system was not as good as the light unit itself . Worn out tyre induced puncture - I suffered one puncture on this ride. This was caused by wear. 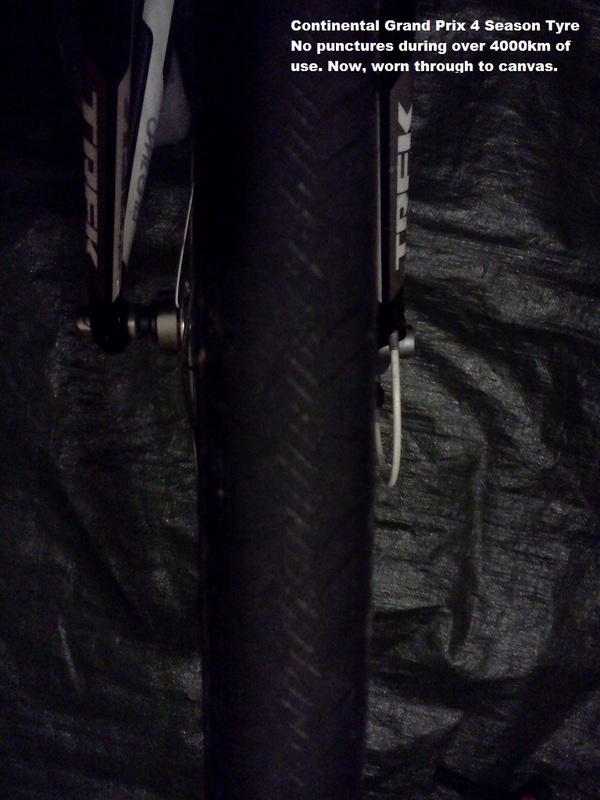 I should really have put new tyres on before the event began, but I was hesitant to add to my array of half worn tyres. Early during lap seven I had to replace the tyre and inner tube after puncturing with the tyre worn through to the canvas around its entire circumference. I continue to be pleased with the performance and relative lack of punctures that I am experiencing when using 700x25C Continental Grand Prix 4 Season tyres. In over 10,000km ridden on these tyres, while I have worn through two rear tyres I have only suffered two punctures, this being the second. Gear cable - On my final lap I assumed I had a severely frayed the rear derailleur cable. Following the post-mortem, it turned out to be gunk preventing cable moment within the cable casing. The original casing has since been replaced by some higher quality shimano cable outers. Thankfully with a support crew in-tow I was able to swap from my Trek Madone “Black Beauty” onto my Specialized Roubaix “Blue Angel” for the remaining 100km. One of the lessons I learned when riding the Paris Brest Paris was how much less tiring a little moon was, than the pure darkness that zero moon and zero sun represent. I should have checked the moon phase before entering the event. During the rain of the first night, the moon rose before the sun. From that point on, the moon was rising at or after sunrise, thus providing no assistance for night riding during this event. I have climbed Waihaha Hill many times, but when ascending at night it is far more ominous than it is during daylight. Without being able to see the top, climbing a hill without corners or changes in gradient the climb to the top of Waihaha Hill seemed like it was never going to end! 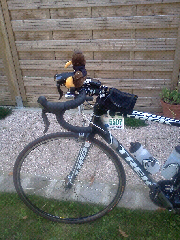 As I am more of a randonneur than a racer I am not accustomed to having a support crew. It may have been hard work for me into the wind but I noted that this type of event is even more tiring for the crew than it is for the rider. I was thankful to have a support crew provided by Mum and Dad (thank you). It was much more comfortable riding at night with a support crew behind me – much more room given by other traffic. Having a support crew was particularly useful during a couple of particularly cold moments in the middle of the night, jumping in the car with all the heaters on was very useful! I had my first sleep a lap sooner than anticipated. With accommodation in Turangi, my plan was 2 3/4 laps, but a combination of darkness in collaboration with rain and strengthening head winds left me tired and exhausted after only 1 & 3/4 laps to Turangi. I successfully set the alarm on with my phone - in silent mode :) and got a healthy 4-5 hrs sleep before departing for Taupo to complete lap 2 . I was now well entrenched into last place. On Thursday and Friday nights I got through two laps a day plus a 2-3 hour sleep and then rode through Saturday night. All up, this would have to be considered a luxurious amount of sleep during an ultra-cycling ride. Typically in these events, those who approach it as a ride get a lot more sleep than those who approach it as a race. The finish was part personal glory, part anti-climax and a few hours later complete surprise. Before the event I had envisaged finishing in 75-80 hours which would have had be arriving shortly before or during the prize-giving festivities. After battling the wind, and sleeping far more than intended I did not finish until 6:45am on Sunday morning. I rode as hard as possible from Turangi trying to finish in under 90 hours, but with no tailwind and nearly 1280km in my legs, the first 20-30km went well but it was a slow crawl into Taupo in exhaustion. Whilst I received some encouraging toots from early departing traffic carrying Taupo riders and their bicycles south, it was no grand arrival. There was no-one there and the timing equipment had all been disconnected and packed up. I recorded my time in paper at the BP station and made my way to shower. I hadn’t realised how well I had placed until my belated arrival at the Enduro Breakfast when talking to other Extreme Enduro riders. While 21 hours behind Ron, 90h45m in the wind was good enough for 2nd place this year. Randonneuring is not well in New Zealand and I had hoped to introduce randonneuring and the Paris-Brest-Paris to the riders that we there from the 2 lap Enduro and 4 lap Maxi-Enduro events. At the time I was so exhausted that I could barely keep my head above my shoulders and as a consequence may not have expressed this as well as intended. Lake Taupo may have a surface area of 616 square kilometres, but on bicycle it is merely a little pond. There is much, much more solo riding in the Extreme Enduro event than in the ‘Solo’ category. I continue to love riding my bicycles. Even in the adversity of riding in the wind, without the benefit of drafting for 1280km I still had a smile on my face the whole way. In trying conditions attributes of determination and stubbornness more than made up for my lack of speed or natural cycling talent. Ultra-cycling events are just as brutal in the form of exhaustion for the support crew as they are for the rider. Stopping for numerous pastries en-route is not as time consuming as riding into a headwind for four days . Yummmmmmm!!! From Pinnacles to Sea with the “has beens"
I briefly came out of tramping retirement last weekend, and went for a tramp with WTMC in the Aorangi Forest Park (also known as the Haurangis), between Martinborough and Cape Palliser. Alistair wrote a trip report for the WTMC newsletter, and has kindly allowed me to re-publish it here. I was down to lead the medium traverse of the Haurangis – one of my favourite set of hills, but with no punters signed up things looked grim until Craig McGregor, an ex-Chief Guide signed up. It’s been a few years since our glory days at the Tongue & Meats, and with no other punters signed up, we were obviously so quickly forgotten! We were a pair of “has been” trampers on this trip with Craig having spent so much time ultra-cycling with his feet cleated to his pedals that he had forgotten how to walk, while child rearing is proving the ultimate endurance event of all for me. Camping at the Pinnacles on Friday night, we were barely tucked away under the fly when the light, but persistent rain started coming tumbling down for the night. At daybreak, a brisk 800m ascent quickly reminded us that the Haurangis although small in stature, are a nuggety and physical place to tramp. We caught the odd glimpse of the sea as the weather alternated between sunny and drizzly as we shared a robust conversation on the subjects of tramping, politics and rugby. Lunch followed the descent to Washpool Hut with a brew cooked on Craig’s DIY beer-can stove, which this tramp proved to be a roaring success. With our tummys fully laden, another sharp ascent and descent led us to Pararaki Hut where we had originally intended to stay the night. There was enthusiasm for an early Sunday departure among other trips with which we shared transport. There was some rugby game on apparently, thus limiting us “has beens” to a only a day and a half to relive the glory days. Over yet another brew, we hatched a cunning plan to push on toward Kawakawa Hut, thus allowing us to complete the originally intended route, with no shortcuts and finish by lunchtime Sunday. This would mean tramping to sunset but as veterans of many a fit trip that was par for the course. The saddle and watershed area between the Pararaki and Kawakawa valleys is a lovely place, great stream travel, marvellous stands of mature native trees and a spectacular descent into the Kawakawa stream over a well marked but not manicured route makes the Haurangi traverse one of the best Wellington based medium tramps on offer. We found the perfect campsite just above the Kawakawa Stream where we dined on chilli con-carne and pasta before pitting down as the drizzle returned, it had been a long 12-hour day, from start to finish but well worth the effort. We were both buzzing. I got ahead of Craig and stopped to brush my teeth, five minutes passed and a little concerned I left my pack where it could easily be seen and headed back down the stream to find Craig to no avail. I had lost my punter in broad daylight in a 10 meter wide stream with a marked route up it! Punters don't just vanish - having thoroughly searched down stream I continued slowly up it looking for tracks, and soon found a single fresh footprint the manhunt was over, Craig had walked passed me while I brushed my teeth, a large boulder separating us and the noise of the stream had rendered me invisible. He had passed 5 meters from me without either of us noticing - as likely as tossing a coin which lands on its edge, we had done the impossible. The next hour was spent catching up to Craig – who all the while was cursing his miserable leader for charging ahead and not bothering to wait or grant him a break, he could not believe it when he saw me approaching from behind – we soon found the funny side of it and returned to a steady pleasant plod over the next saddle to Mangatoetoe Hut for a quick bite before the final trudge to the sea with the sun finally coming out in earnest. You can find more information about Aorangi Forest Park on DOC's website. I went on my first tramping trip in a long-time last weekend. One of the things I tried out for the first time was Memory-Map’s Toughprint™ Waterproof paper. Most of my maps, are now on a projection that is no longer used so I used the Memory Map software, and my inkjet printer to print the maps of where I was going, instead of trying to track down the correct map sheet in one of the tramping shops in town. I printed the 40km journey on two sides of the same sheet of Toughprint™ paper. I was dubious, as to whether, regardless of the waterproof paper my run of the mill Brother Inkjet printer could really print waterproof maps. To my surprise, it worked out far better than I ever imagined. Even a deliberate dunking in the Mangatoetoe Stream at the end of the trip has failed to cause ink to run, or the paper to tear. I was quite impressed. When printing your own maps, ensuring the hardcopy that comes out of your printer is at the correct is one of the challenges. The Memory-Map software addresses this, by changing the selection order in that you first select your paper-size and your margin-size before offering you the opportunity to select the area of map that fits those dimensions. When measuring with the ruler on the compass I could distinguish any scale inconsistencies in either the lounge, or out in the hills. Not worried about map destruction, and a smaller size with less unfolding it was certainly far more convenient to keep a copy of the map in my pocket to constantly refer to throughout the weekend - especially in the less than perfect weather. Following the trip, I have noted black ink has run through the paper, in that it now visible from the opposite side – particularly in the blue (sea) areas of the map. This is possibly related to the dunking in the stream. I also think, one needs to be careful at not being too minimalist when printing their own maps. The coverage on two sides of A4, at 1:50,000 is not great, and if inclement weather, or an injury changed route plans it is possible that you may want to travel outside of your self-printed map sheets. Including escape routes is vital. Ultimately, I think in future I will use a mixture of official map sheets, and self-printed map sheets depending on the nature of the trip and the size requirements of the map sheets. I am without doubt, that an A4 waterproof map in my pocket will be invaluable in critical navigation portions of future backcountry journeys. Now this is what I am really here for :). This delightful little dessert was created to celebrate the first Paris-Brest-Paris in 1891. 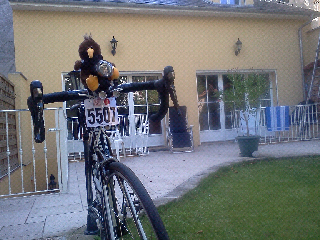 Now the Paris-Brest-Paris took me some 85h32m to conquer. 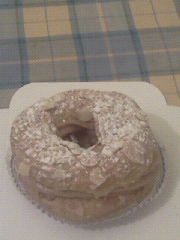 I do not think the Paris Brest has a hope of lasting that long as I am about to devour it. Only ten hours before the start of the Paris Brest Paris. Passed bicycle inspection yesterday and received my Super Randonneurs medal for completing 200km/300km/400km/600km Brevet series this calendar year. There are all kinds of bicycles and human chain driven contraptions amongst the largest parade of brooks saddles and carradice saddle bags that I have ever seen. Im keeping it simple with my Trek Madone road bike and a hydration pack. Last night there were a few fireworks which were closely followed by a far more impressive and genuinely epic electrical storm. The thunder sounded like cannon fire. This morning the skies are calm. Hopefully there will be no more thunder & lightning over the next few days of riding. I plan to spend the rest of the day sleeping and eating before making my way to the start. So long, winter and your Antarctic southerly blasts, rain, wind, hail and snow. Winter, your snow is very pretty. I love it when I am tramping, but it is most unhelpful when I am training for epic cycling events.You have made training very difficult and unrewarding. I’m about to land in summer, so see ya later winter - it shall be another year before we meet again. Photograph taken from outside my house in Johnsonville, Wellington the day before departure. I am feeling a touch underdone. I would have preferred to have ridden one last 400km ride in the past week. Caught in falling snow last weekend, did not make riding past evening and into the early of the morning a very good option. I believe that arriving in a more favourable climate will make everything a whole lot more pleasant. That should help the cycling performance in itself. So with two brand new tyres and a new chain I’m off on the 1231km adventure that is the Paris-Brest-Paris Randonneur. No doubt there will be suffering along the way, since I only have three days and 18 hours to complete the distance. That said, on my bicycle all suffering is taken with a big wide grin on my face. If you are at home in New Zealand, tightly hugging your heater no doubt, you can follow my ride in the warmth of the European summer at http://www.kiwirandonneurs.org.nz/live or http://www.audax.org.au/pbp2011/mobile.php. On Twitter follow hashtags #pbp2011 and #pbpan. Kiwi Randonneurs custom jerseys for Paris Brest Paris 2011. A fusion of a silver-fern New Zealand national jersey, and the official logos of the Paris-Brest-Paris, slightly kiwified. Do Gatorskin tyres have sidewalls made of cheese? My current favoured tyre choice are Continental Grand Prix 4 Season (700x25c). Due to sourcing and pricing issues I usually buy these online from the UK. I’ve been saving my spare pair to start the Paris Brest Paris brand new so bought a set of Continental Gatorskins, also of the 700x25c sizing. The Gatorskin’s are sold on the puncture proof qualities making them ideal for commuting and winter riding. This is the second set of Gatorskin tyres I have had very short life from. Previously I convinced myself my experience was an aberration. Now however, I am convinced that the Gatorskin tyres have sidewalls made of cheese. In both cases, I have not had a puncture through the main treadline, but riding at night in winter after rain I have found a unique ability to slice directly the sidewall as I skim past on-road debris whether it be rock or debris. So in the space of a week I have replaced my rear tyre twice. Firstly, a loyal and faithful GP4, after over 4000 punctureless kilometres on New Zealand’s chip sealed roads this tyre had been worn through to the canvas, and less than a 100km later a sidewall failure on the replacement Gatorskin from the same company. This led me to question why the Gatorskins have a good reputation. It would seem the results of a search for “gatorskin puncture resistance” returns a different set of results to “gatorskin sidewall failure” – the later showing that these tyres are indeed, made of a stinky, soft substance known as cheese. Footnote: Please be aware that the manufacturer states on their website that this tyre is made of Duraskin-anti-cut fabric, and not cheese as I allege. The manufacturer should know more about their product than I. A durable carbon black mixture, a well regarded puncture protection system and DuraSkin-anti-cut fabric turn the GatorSkin, formely known as Ultra GatorSkin, into a real long distance runner. Shortly following last year’s Lake Taupo Enduro (2 laps), I pre-registered for 2011. I did not have to choose my category immediately so I had thought I would choose on the basis of what is left of my little legs when I return from riding 1200km in France. However, I have now received an e-mail to confirm my category before 31 July, and that would be before I leave. Thank you for making an Early Bird registration for the Lake Taupo Cycle Challenge2011. As advised your Early Bird entry was a preliminary registration & now that full registrations have opened you need to complete a full online entry using a VIP code to complete the process. PLEASE COMPLETE YOUR ENTRY BY 31 JULY. On the basis that the ultra-distance cycling is helpful for the “diesel engine” staying power, but not for responding to sudden accelerations and attacks, I had ruled out the Solo (153km/1 lap) long ago. So it had to either the Enduro (313km/2 laps), the Maxi Enduro (626km/4 laps) or, the Extreme Enduro (1252km/8 laps). After much deliberation I decided to go hard and enter the Extreme Enduro, for which I have been allocated bib number 9902. I have yet to ride a 1200, but will have three months between the Paris Brest Paris and the Lake Taupo Cycle Challenge to either regret the decision or look forward to improving my time over this distance. Usually I would usually prefer more variety by not circulating around the same course. Shimano PD-R540 pedals are an entry-level road SPD-SL pedal with a good broad pedalling platform. They are excellent value for money and perform well. I just not sure that the plastic “body cover“ inserts are the best design that Shimano has ever had. Having not kept an eye on the wear of little piece of plastic and riding more than a few miles I’ve just replaced them with a set I bought on a heavily discounted sale. Will keep a closer eye on the plastic body covers this time. The “SHIMANO” branding was reduced to “S-----O” over time and I had also managed to burr off the outside edges of the area which the plastic body covers insert into. With the miles I am pedalling, I may look at upgrading to 105, or Ultegra pedals that do not use the plastic body covers in the future. Old pedals with plastic body covers removed. Showing wear to alloy parts of the pedal. “The Pond” shrinks by 3.5km? Climate-change? Volcanic activity? Seismic shift? No, just a minor course switch-a-roo. I just noticed on www.cyclechallenge.com web-site that the there are some course changes for the 2011 Lake Taupo Cycle Challenge. Obviously it still goes around Lake Taupo, so affectionately known as ‘the Pond’. This year, the relay riders are riding up Poihipi Road, instead of the undulating Whangamata Road, and the solo riders are taking the more undulating option along Whangamata Road. The descent at 11km could get “interesting” in a large bunch? In all, for single-lap solo riders there is 3.5km less terrain to cover. If you have been close to a goal like sub-5 hours, or 4h30m etc it may be an ideal opportunity? I'm yet to commit to a specific event at Taupo this year, but it most likely to be in one of the Enduro categories so I will not get to ride on any different roads this year. Added 19/6/2011: While the net climb of the routes is obviously equal, there is an extra ~90m of cumulative vertical ascent on the more undulating Whangamata Road route. I estimate it would be approximately 4 minutes quicker for an average slow-coach like me when accounting for 3.5km less distance, 90 metres more climbing and a more undulating course rather than a persistent climb to open up. Long time, no blog updates. Been busy working and riding. What have I been up to? Lots of long distance randonneur cycling. I have now qualified for the Paris-Brest-Paris in August :). Since I seem incapable of riding fast, I’m having a go at riding long this year. The Paris-Brest-Paris is the longest running cycle event in the world with the even dating back to 1891. It has not been professionally ridden since 1951 and is now ridden every four years as a randonnee/brevet or, every five years as a Audax 22.5km/h ride. 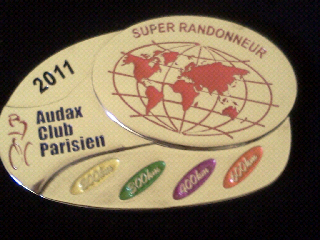 To qualify I needed to ride a series of qualifying brevets, registered with Audax Club Parisien over distances of 200km, 300km, 400km and 600km. I exceeded this with 1x200km; 1x300km; 3x400km and 2x600km brevets – enough to qualify twice. The qualifying rides organised by Kiwi Randonneurs took me all over the lower North Island and the top third of the South Island. My strongest performance by a long way was the Lake Taupo Enduro. My favourite ride was Nelson to Christchurch which took me through the Buller Gorge, down the West Coast, Around Lake Brunner and over Arthurs Pass (two-foot gear was required). I’ll endeavour to catch up on my blogging with a brief post about these rides between training. Meanwhile, you can click through to the Garmin data to see the routes. Randonneuring is not well known in New Zealand. We had between 2 and 6 riders starting each brevet. With the number of riders who enter long distance events at Taupo etcetera there seems the potential to grow this discipline of cycling in New Zealand. We are currently looking at establishing a local club to promote this discipline more in the future. Date Brevet Name Distance Avg Spd.